No more gutters to clean, no more ladders to climb.When gutters become clogged by leaves, pine needles and debris, your gutter will overflow causing damage to your landscaping, basement or foundation. 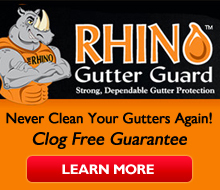 UltraFlo offers you the perfect solution to prevent leaves and debris from clogging your gutter. No Replies to "Ultra Flo Non Stick Cover Priced Right"